We candle peafowl eggs see if the eggs have been fertilised and if they are developing into peachicks. When we candle an egg this also tells us if an egg has stopped developing later in the cycle. Although some people like to candle peafowl eggs early in the incubation process, I prefer to wait until day 14 of the incubation cycle. The only time I candle earlier than this is if I am running out of space within the incubators. You need to be quick to ensure that the eggs stay warm during the candling process. It is easy to make your own low cost candler. Get a torch with a flat end so it can shine with the light shining up vertically. Find a hard piece of card about 6 inches or 15 centimetres long by 6 inches or 15 cms square. You can use a cereal box or other grocery box. Cut a hole cut in the centre about one inch or two centimetres in diameter. Turn on the torch and stand on its end with the light shining upwards. Ensure that the torch is secure so that it cannot fall over and break a precious egg. Place the piece of card on top of the torch as a result the light will shine through the hole in the centre of the card. Remove eggs from the incubator in small batches. It is important to keep the eggs warm during the candling process. 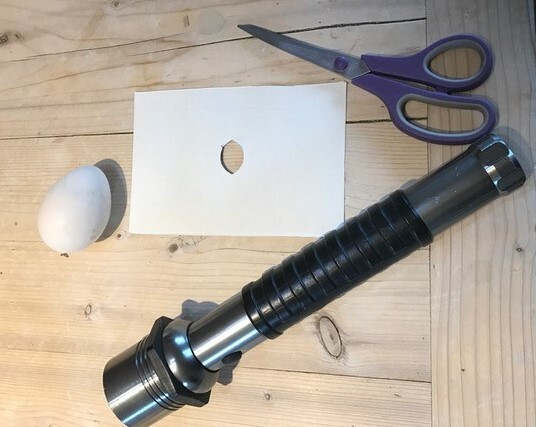 Hold the egg up to the torch on top of the card with the wider end at the bottom touching the card. You will need to be in a darkened room. If the egg is fertile you should see veins or a darker spot within the egg. Consequently any peafowl eggs that glow translucent are unfertilised. Finally discard any unfertilised peafowl eggs. This gives the fertilised eggs a better chance of hatching. Also there is less chance of an unfertilised egg contaminating the other eggs within the incubator. 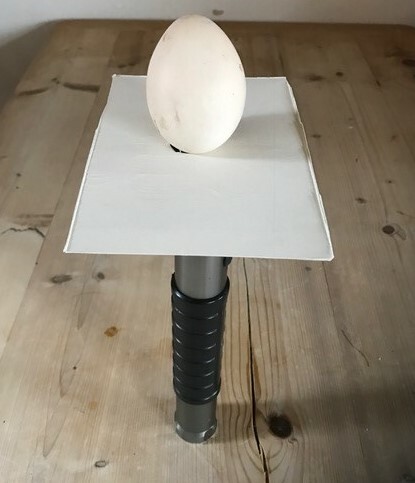 I candle the peafowl eggs again at 26 days prior to moving the eggs into the egg hatcher. Again discard any peafowl eggs that have not developed to prevent them from contaminating the rest of the eggs during hatching.